Are you passionate about helping people with disabilities achieve their goals and accomplish new heights? Do you enjoy a challenging, on-the-go work environment where you can learn more about yourself and others than you ever expected? 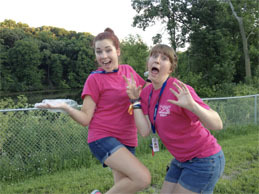 If yes, then you may have what it takes to be a member of our celebrated team at Camp High Hopes. Current staff and volunteer opportunities are listed to the right with more information available by clicking on the positions title. Camp High Hopes is an alcohol, drug, and tobacco free workplace. EOE.